Both banana and plantains are perennial crops that look very much the same. 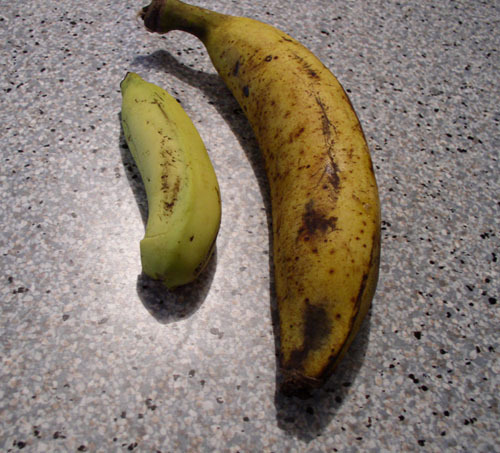 People often confuse plantains with bananas, since they look a lot like huge, unripe bananas. Despite similarities, they are two different culinary crops, with banana being a fruit while a plantain is usually treated as a vegetable. Plantains are thick and large with a firm texture and are usually bland in flavour, while bananas are much smaller and have a very thin skin. They are also softer in texture and have a sweet taste. Plantains are cooked before they are consumed and can be used both ripe and unripe. They have lower moisture content compared to bananas, which is why they cannot be consumed raw, even after they have ripened completely. The high starch content and firm texture (even after cooking) of plantains make them inedible. Bananas on the other hand, are often eaten raw, and only after they are ripe. Plantains are often used in main course dishes in Indian and Caribbean cuisines. When fried or baked, they can also be served as a side dish. While bananas are consumed as dessert, mostly in salads, cakes, pies and other baked items, they are also used to make shakes and smoothies, particularly in tropical regions. At times, they are also used to make banana chips, a healthy tea time snack. Bananas are a great source of potassium and are very effective in building up muscle mass. The potassium content present in bananas helps repair damaged tissues and keeps them from feeling sore after exercise. Plantains, on the other hand, are rich in starch and have a low sugar content, which makes them a rich source of carbohydrates. While there are a lot of differences between these two edible items, they both are highly nutritious and should be part of your weekly diet plan, if not daily. Both plantains and bananas are a rich source of Vitamin A and Vitamin C and are high in dietary fibre as well. The high level of vitamin C present in these is also essential for a strong immune system. Plantain is perennial herbaceous plant of the genus Musa. The fruit of this plant resembles in shape and colour to banana fruit, but is much larger and thicker than the latter and is used for cooking purposes. This plant is native to India and is cultivated most widely in tropical climates. Plantain fruit is often called pasta and potatoes of the Caribbean. Banana is an edible fruit produced by the herbaceous flowering plants of the genus Musa, but it is most commonly used to describe the sweet banana, also called dessert banana, which is smaller in size and softer in texture and is usually eaten raw. It is native to tropical regions of South and Southeast Asia.